Holiday cards are a great way to get your senior loved one to pass time and create a way to connect with other friends and members of the family. As this craft is very simple you won’t need many supplies. You can feel free to add as much as you want or need to making cards. You can add glitter, string, and/or glue depending on how far you decide to take it. This craft, while slightly more complicated, is simple enough that you can stand back and watch your senior loved one enjoy. All you need to do is fill the jar with water and add a few tablespoons of glitter. Then, you take the lid of the jar and use glue to attach the and little figure or toy you want on the inside of the lid. Allow it time to dry. Once it’s dry you seal the jar normally. You can then flip it over and shake it once it is sealed well. You then have your own hand made snow globe. Making a wreath, much like a holiday card, can be made as simple or as complicated as you like. Keeping it simple at first, can be a great option. Taking leaves that you can find outside is a simple choice. Opting to buy fake leaves from a craft store is also a good option. All you have to do is decide on how big you would like to make your wreath. Start by making a circle of the leaves and gluing the ends to each other. Then layer as many as you would like around the circle, and keep gluing until your wreath is the size you you would like it to be. While more complicated than the other crafts described, pillows can be fairly simple to make. With the two pieces of fabric, cut two inch slices down all the way around each. This is so that you can tie pieces from each piece of felt together to hold the pillow. This is an ulterior to sewing the pillow together. With this method you don’t need a needle and string. Once you’ve cut the two inch slips down, tie one piece from one piece of felt to another piece of felt so that you are attaching the pillow. Do this for three sides of the pillow. Before doing the last side, remember to stuff the pillow with pillow stuffer or feathers. Then you can continue to seal/tie the pillow together. At the end you can decorate the pillow with felt markers to say whatever you would like. It can be seasons greetings, or cut out more pieces of felt and make other words you would like to attach to the pillow. Keeping seniors participating in activities as they grow older is one of the best ways to keep them engaged in life. 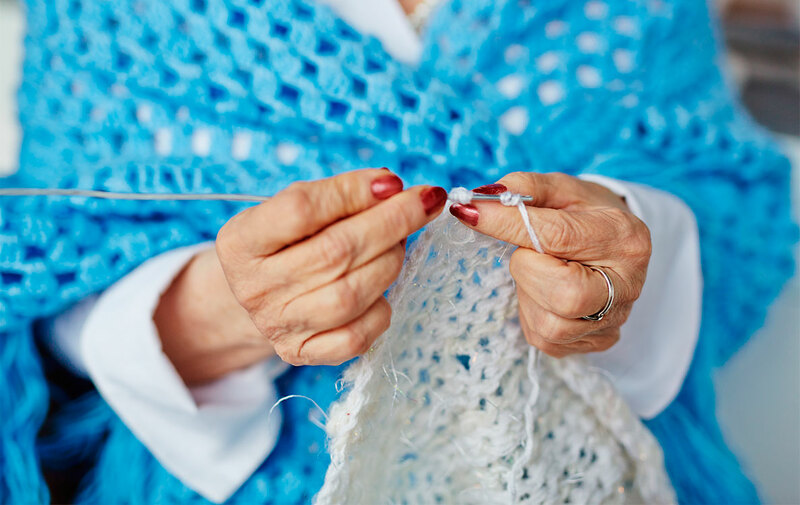 Activities like crafts and brain games keep seniors’ minds sharper. These small and simple activities are the types that our Chicago senior home care services provide routinely. Homecare Powered by AUAF goes above and beyond to provided the best Chicago home care services. The activities listed above are just some of the ways that we want to keep your loved one motivated and engaged throughout their senior years. When it comes to Chicago home care services, sometimes home care aides need to be creative with activities as the weather keeps our loved ones home bound. We at Homecare Powered by AUAF strive to make your loved one’s days easier, and this is one of the many ways in which we do so. Learn more about the types of home care services we offer or give us a call at 773.274.9262.